What began as a retirement project has morphed into a very interesting retirement project. Both Jacks are carpenters, and well... Jacks-of-all-trades, so the warehouse keeps them busy. Luckily they get some time off in the winter to ski when it's just too cold to work. "The Warehouse" continues to evolve. In 2016 it was rewired, cleaned, and concrete was poured to fill deep channels that were once used to move sawdust. In 2017 further improvements were made including removal of a wall to expand Adventure Building Camp's work space. The photo left shows the ramp that was added to the second story in the fall of 2017. 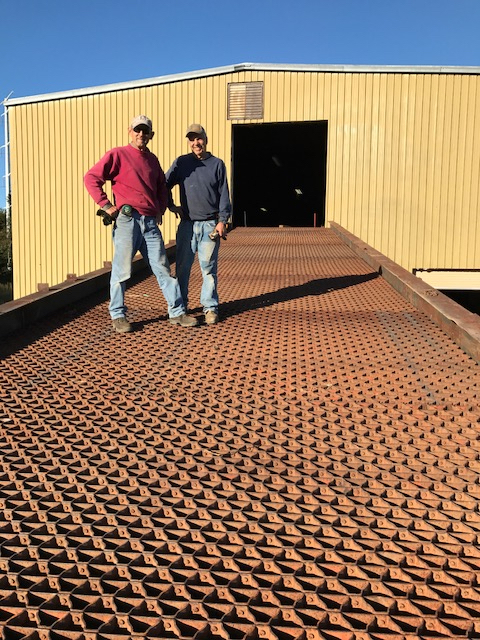 This incredible iron and earthen bridge was made with reclaimed flooring grates from the Dead River Bridge. The ramp will allow for recreational vehicles to be stored on the upper level of the warehouse. The Warehouse plays host to Adventure Building Camp and other seasonal programs alongside the business Dead River Storage LLC. It was formerly known as Schneider Logging Mill, and lumber from all over the region was once milled here. You can still see some of the original iron gears and steel machinery that was incorporated into the infrastructure as you look up through the steel lattice flooring. The building is not far from the Dead River. The 4,200 mile long North Country Trail runs through the property's edge, where runners, mountain bikers and dog walkers appreciate the special beauty of the area. Often, you can hear the whistle of cargo trains rumbling past as they carry tactonite (iron ore) pellets en route to the Ore Docks that are located a few miles away on Lake Superior . I'm a farm kid who now lives in the big city. I've spent most of my career teaching internationally and have been heavily influenced by the philosophy and methodology of the Maker/Tinkering movement. Although I have worked for most of my professional life in a formal school setting, I keep getting pulled back to the education I got on my family's farm. I had a barn full of square bales, my insect net and the neighbor's pond. The rest of my life has been anchored upon those experiences of being thoroughly lost in play. When I first saw The Warehouse, I knew it was a place of possibility and the perfect base for amazing adventures. Currently, I'm the director of educational programming at The Warehouse and I collaborate with a host of amazing staff to put on Adventure Building Camp: a program that embodies the awe-inspiring experience of being a kid.